Any time you go to do some Grilling, one of the secrets to being a culinary master of the grill is using the best digital meat thermometer for grilling. Do you go through the problem of everyone wanting their steak cooked a different way? These top 5 meat thermometers take the guesswork out of grilling that perfect steak to exactly how everyone in your family prefers it. They also help you from under-cooking meats such as chicken and pork which could put you at risk for dangerous bacteria in your food. Plus, they stop you from over-cooking and ruining the meat – nobody likes a dry, hard piece of meat! A best grilling thermometer will raise your culinary skills as a chef, no matter where you are starting out at. In order to find the right meat thermometer for your needs, you could always purchase one and try it out, but that can get expensive if you don’t get lucky on your first try. Therefore, the best and more cost-effective way to find the right thermometer is to read some reviews first. In this way, you can see what has worked for others and what hasn’t, and which thermometers are good for each situation. The best cooking thermometer will be different for everyone depending on personal needs. So, What Is The Best Thermometer For Cooking? 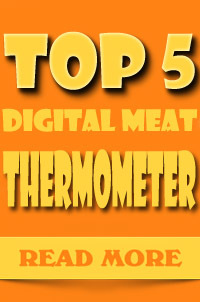 Below you will find meat thermometer reviews on the top 5 meat thermometers available for grilling so that you can make a decision which is best for you. This Maverick Et-732 review goes over all the fine features of this thermometer, including the fact that it can read the internal temperature of meat from up to 300 feet away. The wireless receiver that is included has an LCD which flashes and beeps when the temperature of the meat goes over or under the temperature that you have programmed. This Maverick meat thermometer has a count-down and count-up timer, while the receiver’s LCD screen is back lit so it can be used at night. The receiver shows you the barbecue temperatures up to 572 degrees Fahrenheit, and has a belt clip and built in stand for convenience. The Maverick remote smoker thermometer also comes with a transmitter which has a wire stand that is removable and also becomes a hanger. The wire for the food probe can be inserted into the meat up to six inches, and both the probe wires are heat resistant up to 716 degrees Fahrenheit. This unit may be used in the smoker or the oven as well, making it even more versatile. An alert warns you if the Maverick wireless bbq thermometer’s transmitter is out of range or if it has lost the radio frequency signal. Your barbecue, meat and timer settings are even stored when you turn off the unit. Read through this Weber 6492 thermometer review, and you’ll see that this little probe thermometer is very affordable and basic, but does exactly what it is designed for – to take the internal temperature of whatever you are grilling so you can be assured it is cooked to a safe temperature. This thermometer gives you accurate readings and is very simple to use, making it great for just about any level of cook. Since this instant read thermometer requires that you just insert the probe into the meat to read the internal temperature, you also avoid having to cut the meat open to see if it is done. When you cut it, you will lose a lot of the important and tasty juices in the meat, plus it never looks as nice in the end when you present the meal. One of the really great features of this Weber grill thermometer is that the head of it swivels, making it even easier to read. The digital display shows your temperature quickly and it is easy to read, truly making this the best instant read digital thermometer available. This Ivation Long Range Wireless Thermometer is another meat thermometer that will monitor the internal temperature of your meats from three hundred feet away. The unit includes a lost link alarm, so if you are too far away from the transmitter it will let you know. You will also get warning flashing and beeping from this thermometer’s wireless receiver if the temperature of the meat goes over or under the temperature you have programmed. This dual probe digital cooking thermometer has two probes which are both heat resistant up to 716 degrees Fahrenheit. The shorter, round tip sensor is the barbecue temperature monitor, while the sharp, longer temperature probe is the actual meat thermometer. The receiver itself can show you temperatures of up to 572 degrees Fahrenheit, and if you need to do your grilling at night, you are in luck since the LCD has a back lit screen. Remote meat thermometer reviews show that this particular model has received a lot of great reviews from many satisfied customers, and it can be used as a turkey/deep fryer thermometer as well. If you are looking for an instant read kitchen thermometer, you’ll want to check out the meat thermometer reviews for this thermometer. It is rigid keeps it from causing any splashing of juices and the long probe prevents any burnt hands. This wireless grill thermometer is very sturdy and of great quality, making it perfect for larger jobs. The long sturdy handle makes it perfect for grilling, and the temperature readings are fast and accurate. Since the screen is right on the handle, you don’t have to fool with a receiver but can look right down at the unit to get your reading. Plus, this digital food thermometer will give you a readout for exactly how done the meat is, not just the temperature, making it a breeze for you to get the meat cooked exactly how everyone likes it. Can be preprogrammed for lamb, beef, chicken, turkey and pork with four levels of doneness –well done, medium, medium rare and rare. This could very well be the best infrared thermometer on the market today. You’ll be able to take accurate temperature readings with this laser-sighted infrared thermometer that is a gun-style. Non contact infrared thermometer reviews for this item prove it to be useful for a variety of things, but checking the temperature of your cooking surfaces is definitely something you can use this little tool for. The Nubee infrared thermometer will give you accurate temperature readings quickly and easily, without ever having to touch the actual surface of an item or area that you are trying to measure the temperature of. That is why this is great for cooking, so you do not have to disturb your food as with other devices. This no touch thermometer will also keep you safe from any burns since you do not need to come in close contact with the cooking surfaces or accidentally bump your hand on a hot surface. As you can see, there are many great options for the best wireless meat thermometer, and the above are only a few of these. When you are trying to decide which one is right for you, consider things such as your main reasoning for needing such a thermometer – safety, accurate cooking, etc. – and what kind of features you would like it to have. Some people really prefer a best bbq thermometer which will tell them not only the temperature that the food is, but how done it is. This takes all of the guesswork out of figuring out if your steaks are medium rare like your family wants, or if it isn’t at quite the right doneness. If you are looking for the best smoker thermometer, you have plenty to choose from as well. Ones with which you can get a temperature reading from a few hundred feet away are perfect for smoking so you do not have to be on top of the unit all the time. Since smoking takes several hours to get your food cooked to perfection, this is a perfect option so you do not have to keep going outside to check on your food. No matter your reason for getting the best digital meat thermometer for grilling, you have enough options that you will easily be able to find the one that will fit your needs perfectly. Plus, you will not have to put out a lot of money for most of the units, so you’ll be able to affordably check the temperatures of every bbq, and have the peace of mind that you are keeping you and your family safe each and every time you grill. The best food thermometer is easily obtainable and is worth every penny.